Meg Whitman, former eBay CEO and California gubernatorial candidate, has joined Kleiner Perkins Caufield & Byers (KPCB) as a part-time strategic advisor, the firm announced in a statement. Whitman will coach and advise entrepreneurs and help evaluate new digital investments. Whitman is in good company. KPCB team members include big names like former United States Vice President Al Gore, Ray Lane â€“ former president and CEO of Oracle Corp., Mary Meeker â€“ former managing director and research analyst at Morgan Stanley, John Doerr, Vinod Khosla â€“ founding CEO of Sun Microsystems, and William Hearst III, director of the Hearst Corporation and Hearst-Argyle Television, among others. "I've known the KPCB team for years "they are fabulous advocates for technology-based start-ups," said Whitman. "Meg helped build eBay into one of the leading players in online commerce," said Ted Schlein, KPCB partner, expressing his view on the hire. "Her experience and strategic advice will be invaluable to entrepreneurs who are rapidly changing the way business is done." Prior to her 10-year tenure as the CEO of eBay, Whitman held positions at Bain & Company, Florists Transworld Delivery, Hasbro Inc., Procter & Gamble, Stride Rite Corporation, and Walt Disney Company. She is currently on the boards of Hewlett Packard, Procter & Gamble, and Zipcar. 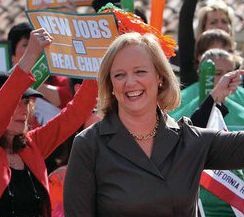 Whitman holds an MBA from Harvard Business School and a bachelor's degree from Princeton University.